We would like to invite photographers, writers and artists of all types to participate in a unique project inspired by Mass Observation. 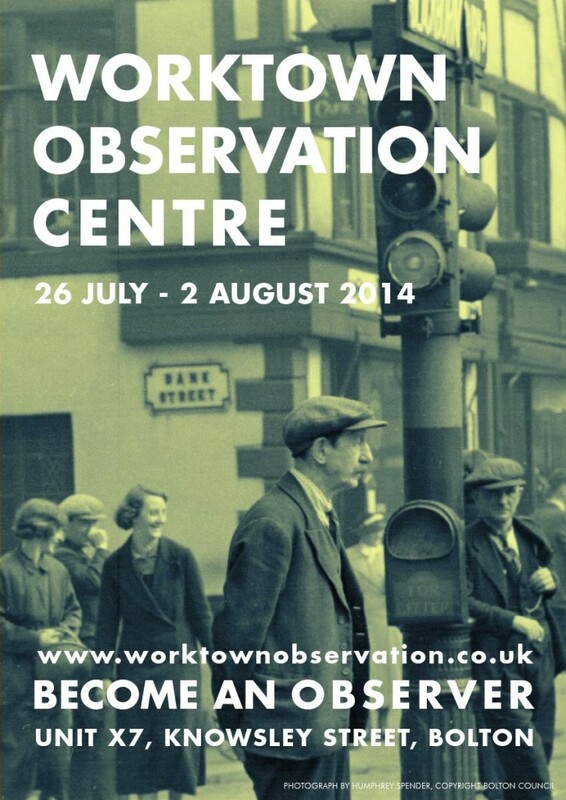 The Worktown Observation Centre will be open in Bolton 26 July to 2 August, in an empty shop space in Bolton town centre. We will create a collaborative visual archive of everyday life in the town during the event. This new archive will have both a physical and digital form (www.worktownobservation.co.uk). We aim to create an event which encourages spontaneous participation. Possible methods of observation include photography, drawing, video, audio, found ephemera, collage….. Proposed projects already include a giant camouflaged camera obscura, collecting oral histories, forensic analysis of people’s gait and observational drawing. We value individual ways of seeing. In 1937 Mass Observation began a unique study of Bolton. The Worktown project brought together photographers, artists and writers to create a new way of seeing everyday life. Visual artefacts created during the project are held in the Worktown Archive (www.boltonworktown.co.uk) at Bolton Museum, and include photographs by Humphrey Spender, collages by Julian Trevelyan and artist Graham Bell’s sketchbook. Mass Observation developed innovative methods for collecting information and tried to capture a multitude of viewpoints and voices. In particular Humphrey Spender’s documentary photographs and Humphrey Jennings’ subsequent short film Spare Time have had an important influence on the development of British visual culture. The Worktown Observation Centre will occupy an empty shop on Knowsley St, Bolton. One side of the double fronted space is hosting a changing daily exhibition from invited community photographers and artists including Liam Curtin, Robert Parkinson (Preston is my Paris) and Mark Page (Museum of Takeaway Menu Art). The other side of the shop will be dedicated to creating a visual archive of life in Bolton’s public spaces. There is space here to display contributions from other artists and the public, which will also be digitised and added to the online archive. We are also running a photograph competition for the public with a set theme each day during the event. Submitted photographs will be displayed in the shop and on the online archive (www.worktownobservation.co.uk ).The winner of the competition will be announced on Saturday 2 August and will receive a £50 prize. Visit the centre (Unit X7, Knowsley Street, Bolton) during the event or the online archive (www.worktownobservation.co.uk ). If you want to ask any questions then please email worktownobservation@gmail.com. We are also running some events which are free but require booking.